“It takes 20 years to build a reputation and five minutes to ruin it. If you think about that, you’ll do things differently,” Warren Buffett once said. Reputations are a tricky thing to measure, and they are especially hard to grasp when a company’s products impact millions of people every single day. Lucky for us, Fortune developed a clever way to survey industry observers and executives, giving us with the data behind our new visualization. We got the data from Fortune’s list of the most admired companies in the world. Fortune took the largest companies in the world in every industry, and surveyed executives and analysts asking them to rate the strength of each one. We took the top 50 all-star companies and placed the logos of each one in a circle within the headquartered country. The size of the circle corresponds to the company’s total market capitalization, with the largest circles representing companies valued at over $500B. We then color-coded each one by industry, and grouped the ones belonging to the same industries together. The result is a kaleidoscopic map of the most admired companies in the world that lets you quickly identify several trends about reputations in the corporate world. First off, companies headquartered in the United States dominate the list, partly because Fortune’s methodology favored American companies, but also because the U.S. simply has the largest economy in the world. Within the U.S., Apple totally dominates with a market cap of $905B, terrifyingly close to becoming the first trillion-dollar company in history. Amazon ($737B) and Microsoft ($735B) also stand out in the computer industry. Interestingly, the fourth largest company on our list is Facebook, but its market cap is significantly less at only $443B. The companies start to get crowded below Facebook’s valuation, as the map clearly demonstrates. In other words, the biggest companies are really, really big compared to everyone else. 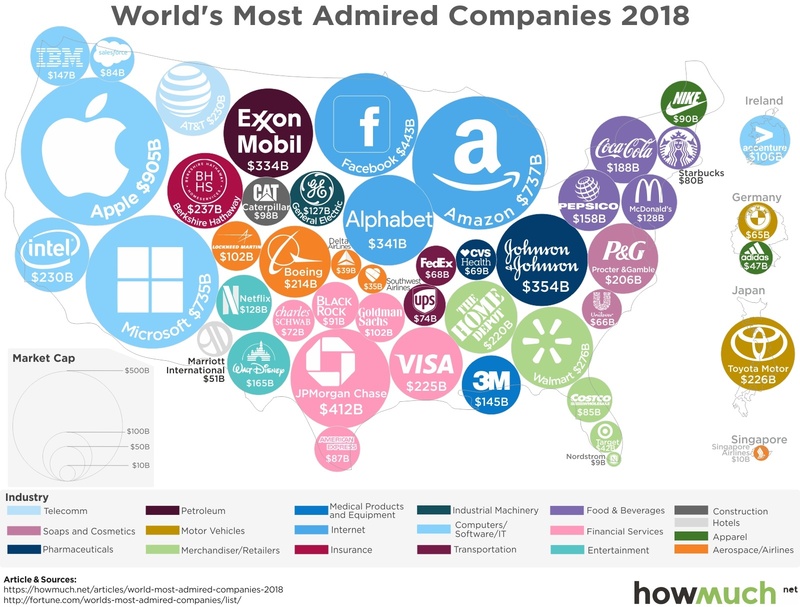 The map also illustrates how the most admired companies come from a variety of different industries. From Internet companies to hotel chains and petroleum manufacturers, it is fair to say that a company can build a solid reputation regardless of industry. Many sectors also have more than one company making the list too, suggesting that a positive reputation can rub off onto similar competitors. One more trend is worth pointing out. Almost all the companies on the list specialize in one industry. The exception is Berkshire Hathaway, which is listed as the only insurance company on our viz. That’s because they own GEICO as well as a few other insurance companies. In reality, Berkshire is a giant holding company with vested interests across a variety of different industries. Amazon, Apple and Google might be headed down a similar path, but they aren’t quite there yet. Building a good reputation requires a killer business model with mass appeal in a single industry. The youngest company on this list is Facebook at 14 years old. Google is the second youngest with 20 years of experience organizing the world’s knowledge. Every other company has a longstanding legacy of product innovation and customer service. It looks like Warren Buffett was probably right with how long it takes to build a good reputation.